I think I already mentioned that I bought myself a long board (sort of a longer version of a skateboard) to fill in the gaps between injuries received from stacking the mountainboard. Well the mountain board has been out of action for a while now as the brake is anything but reliable and keeps breaking which takes all the fun out of it and invariably leads to me breaking too so I’m now in the process of figuring out whether the brake is actually defective or installed wrongly and whether it’s covered by guarantee or not. Not really relishing slamming into rocks and trees at high speed I have stopped riding till I sort it out. In the meantime as the family are at the seaside for 10 days I’m off longboarding most evenings. Fortunately it is a slightly less damaging occupation than the mountainboard. at least at my level. Being a bit too blasé though and not concentrating as I probably should I have had a couple of rib smashing falls to rival the mountainboard crashes but I have curbed by initial madness now, taken my age into consideration and realised that I’m no longer invincible and instead thinking I’m on a smaller version of the moutainboard and trying to negotiate hills that I am in no way competent enough to even think of tackling I am now riding a short, shallow bit of road learning the basics, like stopping, which does seem to be a sensible move. 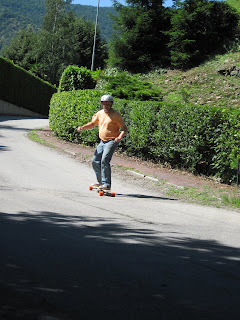 Finding places to go longboarding in the Pellice Valley is not as easy as I expected. Everything is steep and the only gentle slopes around are either too busy or in horrifically bad repair to be an option with my current lack of braking capability or full of spectators so I’m sort of stuck with the bit of quiet road I’ve found down by the river. I hope all this will change when I eventually learn to brake and to stop and can tackle more interesting bits of road. At the moment I’m getting a definite buzz out of carving. It’s not a sort of sensation that you get any other way, playing with gravity at ground level without snow, well not in my experience of life anyway. When you get it right it’s amazing and the board, a Loaded Dervish same as in the video I’ve linked to, is really responsive. I’m quite surprised considering that a short while ago even standing on a balance board was a challenge, that I can stay on the bloody thing at all so anything more is pure bonus balance. Just about every evening I find I can push the board and my balance just that little bit further than the evening before, curve just that little bit tighter. Looking at the clips on you tube it doesn’t look too difficult but believe me age, lack of flexibility, definite lack of courage (stupidity is different) all take their toll. I thought that scrubbing off speed by sliding the back wheels out when carving would be simple. It looks bloody simple. It’s taken me a week just to master the board and myself to be able to do that enough to actually slow down a bit. I’ve fallen in love with longboard dancing (featured in the video) in fact this video was what decided me, instantly, that longboarding is what I wanted to do. I can do a few of steps, badly, with no grace or finesse at all but I’m working on it and it’s fun trying. Just tried a road near the house which gives me a good moderately slow run to practice on so I’m improving. I took Flora there the other day (photo). What it took me a week to learn she accomplished in about half an hour. Grrr!!. Next time I’m going to get her to put welding goggles on to balance out the odds a bit. You will of course be surprised at just how similar my physique is to that of Adam and Adam in the video. This is the result of intensive training.